Merge Conceptual Design, the artist team of Franka Diehnelt and Claudia Reisenberger was commissioned to develop color palettes and tile artworks for two stations along the El Monte busway. 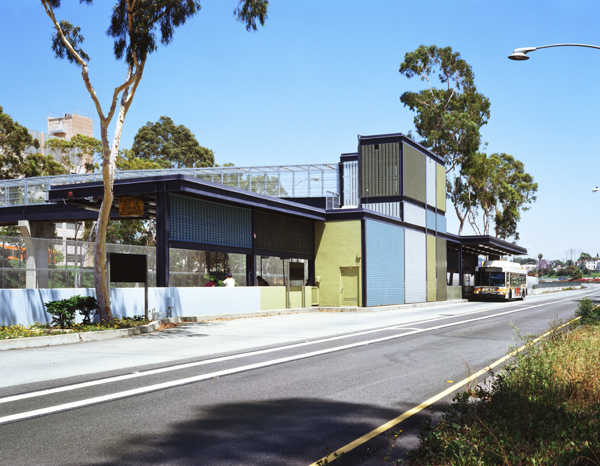 For the USC Medical Center Station they devised paint and tile schemes that transform the dreary pedestrian bridge and corresponding bus terminal into stylish urban focal points. The artists made their color selections based on light studies of the facility at different times of the day and chose a harmonious paint palette of cool blues and greens. Tile murals at the bus boarding and elevator lobby areas continue these colors, with imagery referencing the east – west bus connection between the San Bernardino Mountains and Los Angeles. Included in the collection of images, all relating to an east/west journey, are a telephone, a medical stethoscope, a hospital uniform, a red chili, poppies, a house, a car, a bus, cacti, a surfer and an open book.